Pickling vegetables at home was a very common activity with past generations. Pickling preserves food, which was especially important prior to refrigeration. The most commonly pickled vegetable is the cucumber, although other vegetables are also pickled. While you might assume pickle juice is worthless and meant to be thrown out after the pickles are eaten, the juice contains nutrients and has value. 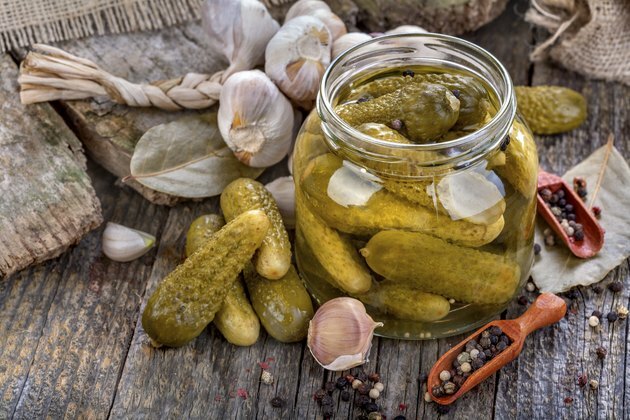 Pickle juice is rich in acetic acid, which helps with digestion and stimulates metabolism. However, pickle juice is high in sodium, so ask your doctor how much of it is safe for you to drink. The art of pickling vegetables and other foods is thousands of years old. Pickling is the process of preserving food in salty water or an acidic solution such as vinegar, also known as acetic acid. Harmful bacteria cannot grow in salty or acidic conditions, but some beneficial species can. Any health benefits gained from drinking pickle juice, including metabolic effects, is due mainly to its acetic acid content. Acetic acid is the primary acid in all vinegars, including white vinegar, malt vinegar and apple cider vinegar. In essence, pickle juice is diluted vinegar, which can be used on salads as a dressing or consumed in moderation as a beverage. The acetyl group in acetic acid is fundamental for the Krebs cycle, which is a cellular process that metabolizes carbohydrates and fat into energy molecules called ATP, according to the book "Human Metabolism: Functional Diversity and Integration." Furthermore, acetic acid has been found to suppress fat accumulation in animal studies. Consequently, consuming acetic acid from pickle juice or other sources may increase your metabolism, but other factors are involved, including the proper functioning of your thyroid gland, liver and pancreas. If you think your metabolism is sluggish, make an appointment with your doctor and discuss all the factors involved. Pickling may also improve the nutritional value of the food and juice by introducing B-vitamins from friendly bacteria, according to the "Encyclopedia of Human Nutrition." Friendly bacteria, like those that live within your large intestine, can proliferate in pickle juice and produce vitamin B-12. Vitamin B-12 has many functions, but it's required for efficient digestion and it stimulates metabolism. The amount of B-12 in pickle juice varies considerably and depends on the pickling technique. Furthermore, a significant proportion of the vitamin may be absorbed by the pickled food and not remain in the juice. Pickle juice is also rich in sodium, which is necessary as an electrolyte, but it can be harmful in large amounts. People with hypertension, or high blood pressure, should be especially cautious about consuming high-sodium foods or beverages. If you are considering drinking pickle juice for weight loss purposes, consuming too much sodium might make you retain water and actually gain weight in the short-term.